Land speculator/investor, Farouk Kubba, purchased the property north of Santa Fe Hills for just under $1.3 million in 1981 (roughly $3.4 million in today’s dollars). Kubba understood that buying the land was a risk. 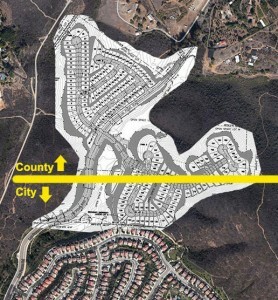 For example, despite the many acres, the steep slopes and constraints leave only a small footprint that is economically feasible to build homes; The land is environmentally sensitive, and contains the headwaters of Agua Hediunda Creek; Finally, a majority of his land is outside of San Marcos, in unincorporated San Diego County land that was (and still is) zoned for much fewer homes. Farouk Kubba hedged his bets for buying this land based on the prospect that San Marcos would eventually annex the land into San Marcos jurisdiction (thus, the land would be subject to the much less restrictive San Marcos zoning rules). An ongoing conflict with the project is that the planning principles of San Marcos City Planners are not in alignment with San Diego County Planners, (or the community!). 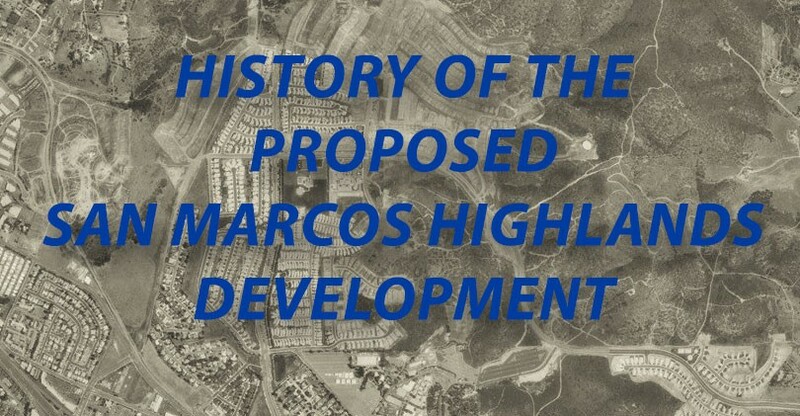 At the time Kubba purchased the land, the San Marcos City Planners would have allowed up to 300 homes on the property (as opposed to San Diego County only allowing 60-70 homes). Part of the City’s rationale for allowing more homes was because more homes will extend Las Posas further north, and more homes will help pay for the future complete extension of Las Posas to Buena Creek Rd. (Note: In later years, San Diego County asked to remove the future extension of Las Posas to Buena Creek Rd., deeming it unnecessary. San Marcos rejected this suggestion and ended up getting their way. This is another example of the difference in planning principals between San Diego County and San Marcos). Nine years after purchasing the land, in 1990, Kubba completed an Environmental Impact Report for a 275-home development. This was the same year that the very first homes of Santa Fe Hills began construction. According to Farouk Kubba, because the housing market was not doing well in 1990, he chose not to proceed with his project and to wait out the market. The population of San Marcos was about 62,000, no Grand Plaza, no 78 on/off ramp at Las Posas, and Paloma Elementary student/teacher ratio was 20/1. Rick Gittings was San Marcos City Manager. Kubba came back in 2002 with a Supplemental Environmental Impact Report and a new home development project consisting of 230 homes. At this point, most of Santa Fe Hills had been built out. There was much less open space available for wildlife, and the distance between the high-density homes of Santa Fe Hills and rural neighborhoods north of Santa Fe Hills was closing in. For many of the same reasons the Highlands is objected to today, it was objected to in 2002. The San Diego County Planning department, the EPA, US Fish & Wildlife Service, California Dept of Fish & Game, and Twin Oaks Community Sponsor Group rejected the project because of Kubba’s plan to build a large number of homes on sensitive, highly constrained, land. The community had the same exact objections, but the community also objected the project because of its relationship to the future extension of Las Posas Rd. Even the San Marcos Planning Commission voted against the project. However, City Council ignored all of the objections, and allowed the project to move forward. Population of San Marcos was about 68,000, still no Grand Plaza, Paloma Elementary student/teacher ratio was 22/1. Current San Marcos Mayor, Jim Desmond, started his first term on City Council. Despite all of the commotion, by 2004 Kubba could not secure all of the development permits. San Marcos City Council approved a 1-year extension for Kubba to secure the permits. The population of San Marcos was now about 72,000, Grand Plaza was in the beginning phase of construction, the 78-on/off ramp at Las Posas was completed, Paloma Elementary student/teacher ratio was 23/1. City councilmember Chris Orlando was on the Planning Commission, and starting his first term on City Council. Jim Desmond was still on City Council. City Manager, Rick Gittings retired this year. 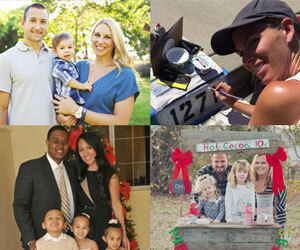 In 2012, the San Marcos population was about 87,000 (up 25,000 from 2002). The 2011-12 student/teacher ratio at Paloma was 30/1 (10 more students per teacher since 2002). A 2013 SMUSD letter says that existing school capacity with SMDUD currently is not adequate to meet the student population, with 4,474 more students than it is equipped to handle. According to a 2014 city survey, the #1 concern of 21% of San Marcos citizens is traffic (up 10% from the 2009 survey). The City is now focused on a Smart Growth strategy, a growth plan that is supposed to prevent sprawl. Former City Manager, Rick Gittings, is now a private consultant for Farouk Kubba. Since 2006, Santa Fe Hills has been completely built out, as well as the construction of the 94-home subdivision of Loma Alta (within Santa Fe Hills), and the ~300-home subdivision of Rancho Santalina (just West of Loma Alta). Additionally, Palomar College is expanding to accommodate more students, the 370 Condos of Palomar Station was recently completed (first intersection exiting Santa Fe Hills), the 368 apartments of Davia Village are expected to start construction late 2014 or 2015 (neighboring Palomar Station to the east), and now the Newland Sierra development in North San Marcos consisting of 2,135 homes is in the pipeline. I don’t have historical traffic figures, but you can imagine the traffic increase getting in and out of Santa Fe Hills now compared to when Kubba first proposed a project in 2002. The San Marcos Highlands project has been a strongly opposed development project since it was first introduced in 2002. Farouk Kubba consistently submits high density project maps that simply do not fit within the constraints of the land nor benefit San Marcos or Santa Fe Hills. San Diego County Planning Division, numerous agencies and hundreds in the community have opposed his high density development maps every time, yet Kubba ignores them. With as many changes that have occurred throughout San Marcos since the Highlands project was first introduced in 2002 (less open space, overburdened schools, more people, more traffic, smart growth planning), a new sprawling home development in this area makes less sense now than it ever has. Contact sanmarcoshighlands@gmail.com for important updates about this project. Post by Santa Fe Hills – San Marcos, CA.